Sufi Muhammad Abdullah Khan Sahib passed away in Birmingham on 12 February 2015 after five decades in the city. As a young man he served in the British Indian Army during the Second World War and fought against the Nazis in Europe. He was held in a German prisoner of war camp for a period of time before escaping with others and making his way into France where a local woman hid them from the Nazis. It was due to the military connection that in 1945 he was to meet Hazrat Khwaja Zinda Pir, an army tailor, stationed in Abbottabad, present day Pakistan, who he subsequently took as his Sufi guide or pir. Zinda Pir , a Pathan, was a pir of the Naqshbandi Sufi Tariqa or order. After leaving the army, Zinda Pirled an ascetic life in the mountains of his native Kohat in the North West Frontier Province of Pakistan in a place called Ghamkol Sharif. He bestowed upon his disciple, Muhammad Abdullah, the position of his deputy or Khalifa. Sufi Abdullah was instructed by Zinda Pir to move to Birmingham on concerns that newly migrated Pakistanis would face obstacles establishing their daily prayers, fasting, observing Eid, teaching their children the Quran and holding gatherings of God’s remembrance or dhikr. So it was, in 1962, that Sufi Abdullah arrived in Birmingham. He immediately began to faithfully carry out his pir’s instructions; he started a Quran class for a small group of children and a dhikr circle, attended, initially, by only two other men. Sufi Abdullah’s house on Durham Road in the Sparkhill area of Birmingham became the hub of the his Sufi order’s activities. The number of attendees at the dhikr circle outgrew the capacity of the property and eventually a bigger property on the nearby Warwick Road was purchased. A regular Saturday night dhikr was established, as well as a meeting room for the community. Muslim and non-Muslim alike, would visit Sufi Abdullah with various emotional and spiritual ailments. It must be pointed out that while engaged in facilitating the above mentioned activities, Sufi Abdullah was working 16 hour shifts, six days a week in foundries, for 24 years. He was not a pir who sat back and lived off his followers. 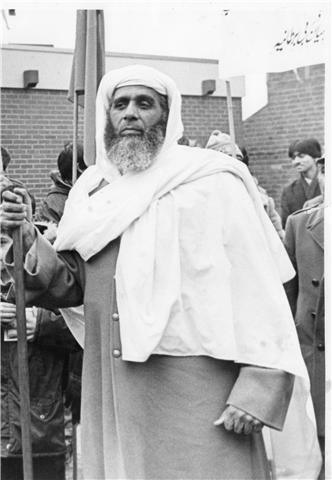 Sufi Abdullah is also popularly credited with organising, in the early seventies, the first jaloos Eid Milad al-Nabi, a procession through the streets of Birmingham commemorating the birth of the Prophet Muhammad (Peace and blessings of God be upon him). During the seventies and eighties the annual celebration of the Prophet’s birth as well as the annual ‘Urs commemorating Zinda Pir, were held at Birmingham Central Mosque on Belgrave Middleway in the Highgate area. During the eighties, a large factory was converted into a prayer hall and a dar ul-uloom, or an Islamic school, on Golden Hillock Road in Small Heath was established. There was also an employment resource centre and a community centre as part of the complex. Through Sufi Abdullah’s tireless efforts a large new mosque with an adjoining car park was eventually built across the road and fittingly named Ghamkol Sharif Mosque in honour of Zinda Pir. The three storey mosque was opened in 1996. The Mosque provides Islamic Funeral facilities and there is also a nearby hostel for the homeless established by the mosque. The Ghamkol Sharif Mosque serves the Sunni Brelvi community with most of the congregation being from the Potwari speaking areas of Azad Kashmir and Sufi Abdullah’s native Chakwal. Sufi Abdullah was a giant of a man. Well-built and handsome. He had none of the languid and affected mannerisms associated with some pirs of the Indo-Pak region; on the contrary, he was robust, direct in his speech, and had a no nonsense approach to things. He was not pretentious nor did he make claims to be a scholar. He passed away at the age of 92 and was given the honour of being buried on a plot of land adjoining the mosque he built. His mausoleum is open to visitors. What he achieved in the five decades is nothing short of a miracle and is testimony to the Divine approval he was blessed with. His presence graced Birmingham. May God Most High continue to reward Sufi Abdullah Sahib for his works.